Search Results for "doctor food"
Male doctor offering medications or healthy food. Handsome bearded therapist wearing labcoat, holding an apple and medications, posing on green chromakey background. 1950s: Woman wraps up baby as doctor writes on pad. Woman lifts baby, walks away with doctor. Woman pours food into dish. 1950s: Boy picks at his food as his parents yell at him. Old doctor examines boy. 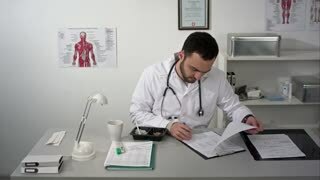 Boy puts shirt on and talks to doctor. Boy breaks down crying. The doctor calls not to eat any harmful food, but to abandon the factory cookie. A local doctor from the turn of the century visits a family with a sick child suffering from food poisoning. Doctor advising a fat woman to eat healthy. Fat woman eating stealthily high calorie foods. Research of GMO wheat in laboratory. Doctor is conducting an experiment to change genome of wheat sprout. Creating a genetically modified plant. Laboratory assistant in laboratory of food quality. Research of GMO peanut in the laboratory. Doctor is conducting an experiment to change genome of peanuts . Creating a genetically modified plant. 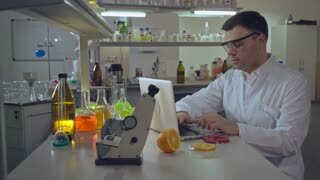 Laboratory assistant in the laboratory of of food quality.